was the legendary 7 inch 6 track vinyl EP that became a highly valued collector's item way back in the late seventies due to only 100 (!) copies being pressed. It contained I Love You Beacause by NEW UNISECT, 'Hallo, Mary Lou' by LARS MATHIS, a 1:30 edit of 'Sweet Little Sixteen' by THE TOMFOOLS, 'Til konfirmanten' by ROMEO & JULIE, 'Hun er bare 15 år by 2T and 'Jim' recited by JAN S PLATOU with 'Abide with me' playing in the background. Except from the complete The Tomfools track, and a brief appaerance by the New Unisect track on OR 25, only one track from this EP has resurfaced. It was the 2T track wich made a guest appearance on the 'The fest of The Tomfools (and friends)' cassette, OR 28.
one of the originally laquer acetates. Authentic recordings of the noice at school back in 1969/70. Recorded by Jan S. Platou. The first record to really be released. Or shall we say: mass produced. It was a 7 inch vinyl single by LARS GRANDE containing the classical pieces 'Elvira Madigan' and 'Air' played on an electronic organ. Recorded in true mono in the basement of the organ /record shop Askeröi and Lars Grande both worked at the time. This is still available. Another cassette only promo product. This time a collection of Askeröi demo recordings given to Kurt & Kara hoping for them to record an Askeröi composition. They didn't. Only a couple of copies were made. Both the Beatles and the Tiger Joe singles were cancelled. The number OS-4502 then finally appeared on the The Tomfools' debut single 'Stå på - rock on!' / 'She's Going Away'. The first (white label) pressing contained a mix without backing vocals on the B-side that never appeared anywhere else. It soon became a collector's item. The second (blue label) pressing has the familiar version found everywhere and is still available. This number was used for The Tomfools' follow-up single 'Cactus Flower' / 'Limping Jam'. In summer 1987 there were plans for reuniting the band NEW UNISECT (featuring The Tomfools from '71 to it's decline in '75/76). 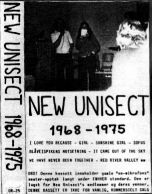 Due to renewed interest a cassette, 'New Unisect 1968 - 1975' was made and distributed to some old band members and some of the original die-hard fans. It was not a 'best of' compilation, rather a collection of amateur recordings featuring as many of the line-ups as possible. The reunion never happened and the cassette was immediately deleted. Only a handful of copies exists. The third single by The Tomfools: 'Sandslottet' / 'Men Sekresjefen sa'. The B-side was written and recorded in one day and immediately replacing an early version of 'Shout Out Loud' without anybody remembering that at least one side of each single was supposed to be in english. Were an unbelievable release. Maybe the world's first single with TWO real B-sides. The norwegian languaged B-side, DA TITTER SOLEN FREM, was a seven minute true live in the studio disaster!!! The guys, which consisted of The Tomfools and some friends, had been working on the backing all day and finally had it 'in the box'. But the vocalist was not well enough prepared and made a terrible performance. The 'band' was named ELECTRIC FRIENDS and the record was taken directly from the uncut and unaltered studio tape. The single received top critics in all norwegian music papers, and mind you: There's no need for knowledge of the norwegian language to see (hear!) the greatness of this recording!!! Local demand for a cassette release (not everyone had a record player back then either) of The Tomfools' singles forced this release. Beside all the single tracks, a couple of new (left-over?) tracks, HUN ER BARE 15 ÅR by 2T from OR 7 and finally the promotional minute from OR 21 (which now is all that is preserved) of TIGER JOE's own and original version of SHOUT OUT LOUD. THE TOMFOOLS are back on the field again. To make up for the all-norwegian last single, both tracks this time were in english, DEEPCLEANING LOTION / MAN WITH A HOLE. The A-side became THE TOMFOOLS' only top 10 hit (so far). Another THE TOMFOOLS single. This time HIS version of SHOUT OUT LOUD c/w one of the 'new' tracks from the cassette OR 28, SNART HAR DU INGEN TOMFOOL Å TRÅKKE PÅ NO' MER. This was just a translation of Buck Owens' YOU AIN'T GONNA HAVE OL' BUCK TO KICK AROUND NO MORE set to a traditional blues melody. (i. e. no copyright problems...). A new, additional, lead guitar was added, by the way..
A couple of friends got married. And giving a rare and brief 'live' performance were THE TOMFOOLS and an occasional band. During the night of the party several attendants asked for a cassette copy when they found out it had been recorded (on a portable deck, only). To keep the promise a low profile MC release was made. Though not promoted it reached the papers and the radio waves. And is still available. But this single got hold up so long due to a burglary that it ended up as B-side to the next single, MAY IT BE (THE XMAS SONG) b/w the previously and elsewhere unreleased Beatles composition SUSY PARKER - complete with 19 seconds of The Tomfools jamming ANNIE MARE. The EP was entitled DOUBLE SINGLE and released in time for christmas. The two singles were released seperately on CD. Clinging to the vinyl single as 'the real thing' long time friend ANETTE SJÅSÆT recordings of her own songs, NO'N ORD and LOVE IS NOW was released. The latter even featured drums by THE TOMFOOLS. On one day's notice THE TOMFOOLS switched to accoustic instruments for the 'live' debut. In a direct radio transmission! Two of the three songs performed in the programme, DEEPCLEANING LOTION and CACTUS FLOWER was given away to fan club members on a cassette single. It was released on the Tomfools-klubben label! Another gift from the fan club: a one-sided single on red vinyl containing a 'live' performance of JOHNNY B GOODE and a 1974 demo version of the Tomfools' original PLAY IT COOL. All records were numbered and each member received the one with their membership number. A three year membership fee can fix you both these collectors items along with TK 1994 - a video made for the 1976 single B-side SHE'S GOING AWAY. The video did not receive an OR number. Eventually even The Tomfools had to admit that CDs were the future. The so far latest single was therefor released in this format only. The main track was THE HYMN OF LOVE. Secondly came the A-side of the previous single, FAIRY-TALE PRINCESS, followed by the planned B-side of that single (but in last minute replaced by Yellow Submarine), VERDENS UNDERGANG. And finally a cover version of Kurt & Kara's SLUTT PÅ JOBB. In connection with the re-release of all the old vinyl singles, a special promo CD single, SHOUT OUT LOUD / THE HYMN OF LOVE was made in a handful of copies. The CD-single re-release of OR 20. The CD-single re-release of OR 23. The CD-single re-release of OR 24. The CD-single re-release of OR 26. The CD-single re-release of OR 27. The CD-single re-release of OR 29. The CD-single re-release of OR 30. The CD-maxi single re-release of OR 31. The CD-single release of the B-side of OR 32. The CD-single release of the A-side of OR 32. The CD-single re-release of OR 34. The CD-single re-release of OR 35. The final release of the norwegian band the willy b review summing up the career with previously unreleased demos, outtakes and 'live' recordings. The follow-up by "the skating tenor". Except for containing four originals and a special cover version of The Tomfools' "The Hymn of Love" with steel drums, it's the same consept as the first one. And this is as far as we've got. This page will of course be updated as soon as any new (old?) product appears. Stay 'tuned' for more information..